The ferroelectric polymer PVDF (polyvinylidene fluoride) has interesting properties and could be used to store information or energy. One of the main drawbacks of PVDF is that extra functional groups added to improve certain properties also interfere with its ferroelectricity. To solve this, scientists from the University of Groningen have created block copolymers from PVDF that leave its ferroelectricity intact, but allow them to tune its characteristics. They wanted not only to study how this polymer works, but also to widen its use to include flexible organic electronics. The results were published in the journal Nature Communications on 6 February. Modification of the material might solve this issue. « However, modifying the molecules by attaching side chains affects their ferroelectric properties, » explains Ivan Terzic, a Ph.D. student at the University of Groningen’s Department of Polymer Science and co-first author of the Nature Communications paper. Together with his fellow Ph.D. student Niels Meereboer and their supervisor, Professor Katja Loos, Terzic devised a way to produce a copolymer of vinylidene fluoride and trifluoroethylene with a functionalized end group that can be linked to an insulating polymer chain to form a block copolymer. Next, the scientists showed that the material forms small domains at nanometre scales through phase separation between the blocks. These domains take different shapes—lamellar, cylindrical or spherical, for instance—depending on the ratio between the blocks. 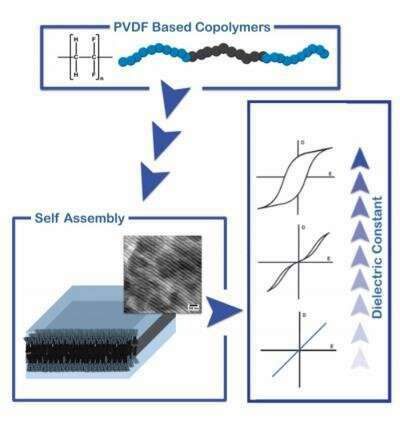 By varying the type of block and preparing block copolymers of sufficient length, the scientists were able to tune the properties of the material. An important part of this work was the ability to make free-standing films of the polymer with satisfactory mechanical properties. This allowed them to investigate the properties of the material.